Revenue generated from taxation allows governments to invest in infrastructure and resources that allow for the delivery of essential services. Broadly speaking, these investments are expected to work towards improving the quality of life for the country’s citizens. However, India’s fiscal policy for public buses – the mainstay of public transport in the country –appears to contradict this objective. A previous blog post on this topic has highlighted the contribution of taxation to both higher bus fares and poorer service quality in India. 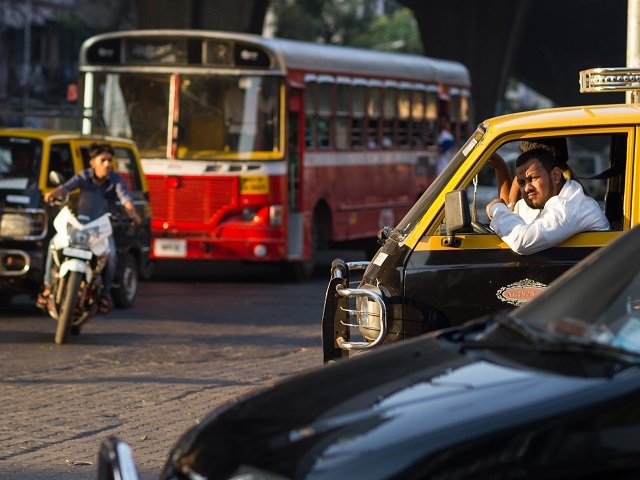 This blog focusses on another aspect of India’s distorted tax policy towards bus-based public transport: its contribution to traffic congestion across urban India. Traffic congestion results when there are too many vehicles for the available road space. While a multitude of factors often combine to result in gridlock, arguably the most important contributing factor has been the explosive growth in vehicles in India; a 6.2-fold increase in the number of registered vehicles in less than two decades, from 33.79 million in 1996 to 210 million in 2015. This unprecedented increase has severely overburdened major roads in most cities, leading to endemic gridlock. Conventional measures favored by governments to reduce congestion, such as road-widening or the construction of flyovers and underpasses, have provided no long-term relief to the problem. This is because increasing roadway capacity induces demand. Realizing that the newly-widened road offers a faster commute, more people (and hence vehicles) start to use the road until all the extra space created by the widening of the road has been filled by new vehicles. A more comprehensive solution is to utilize road space more efficiently by prioritizing high-occupancy public transport, such as buses, over private vehicles. This requires a two-pronged approach: 1. improving the quality of public transport to incentivize usage and 2. discouraging people from using private vehicles. In this regard, a good fiscal policy can play a major role. Taxation can serve several purposes for a government. Apart from revenue generation, it can also be used to influence citizen behavior – by taxing unhealthy or unsustainable practices at higher rates, discouraging their use. Mexico, for example, introduced an additional excise tax on sugar-sweetened drinks in 2013, estimated to have reduced consumption of sugary drinks by close to 12 percent in a year. The added revenue from such tax measures has, in several cases, been used for the amelioration of problems caused by such behavior. For instance, California increased taxation on cigarettes in 2012 and used the additional revenue to fund cancer research. Direct taxes (Motor Vehicle and Passenger Tax): Better known as “road tax,” this is a state tax levied to meet the costs of construction and maintenance of roadways. Certain states also levy a passenger tax on the revenue generated from ferrying passengers by State Road Transport Undertakings (SRTUs). These two taxes form the bulk of direct taxes paid by SRTUs. While private vehicles (cars and bikes) also pay Motor Vehicle Tax, it is a one-time payment, usually a percent of the vehicle’s value. SRTUs, on the other hand, pay Motor Vehicle Tax either quarterly or annually based on their bus capacity, revenue or routing (depending on the state). Taxes on fuel: Several countries use revenue from fuel taxes to subsidize or otherwise support mass transit. In the U.S., for example, approximately 16 percent of revenue from excise duty on gasoline is earmarked for mass transit. The UK provides a fuel subsidy from existing fuel duties to transit operators in the form of the Bus Service Operators Grant to keep bus operating costs manageable. Higher retail fuel taxes serve as a deterrent to private vehicle use for nonessential trips, and can also subsidize public transport. In India however, SRTUs (apart from Rajasthan) currently pay the same rate of tax on diesel purchased as private vehicles. In fact, from 2013 to 2015, bulk purchasers were expected to pay a significantly higher rate per-liter for fuel purchased, due to the dual-pricing scheme introduced by the UPA government, effectively subsidizing private vehicles at the cost of public transport. 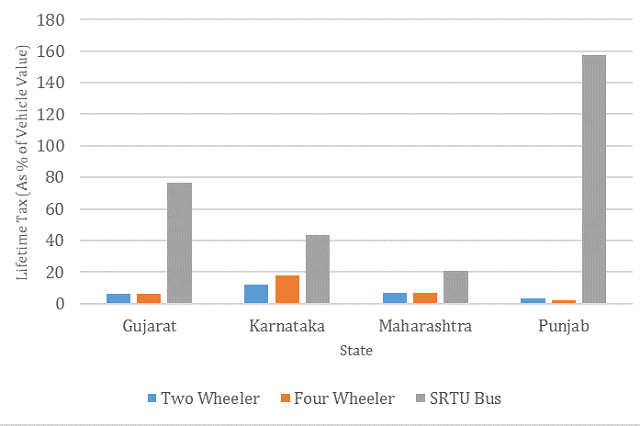 India’s fiscal policy towards public transport is rather lopsided, often taxing public buses far higher than private vehicles. While increasing taxes on private vehicles is rarely a popular move, the long-term benefits of rationalizing road taxes in favor of public transport outweigh the short-term political costs. However, it is important that public transport service quality and supply is rapidly improved, rather than a sole fiscal disincentive towards using private vehicles.